It offers an all-year-round climate ideal for holidays and tourism. Conveniently, most things to see and do in Brisbane are centrally located either in - or close to - the central business district. 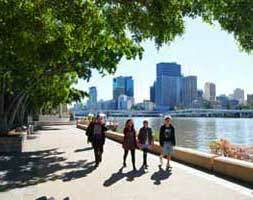 South Bank is an artificially-created beach and parklands area along the banks of the Brisbane River, opposite the CBD, which features a protected swimming area complete with lifeguard. From South Bank you can access the city and its attractions as well as the river ferries and the nearby Brisbane Botanical Gardens. On the other side of the river, further along, is the Riverside Centre, which has a selection of cafes and is the embarkment point for paddlesteamer cruises on the river. The river is one of the city's main attractions and there are many cruises that pass under under the Story Bridge, on their way to popula destinations like New Farm and Bulimba. The river is also the setting for the annual Riverfire fireworks display. Adjoining the CBD and not far from the Story Bridge is Fortitude Valley and the Brunswick Street Mall with its many cafes and hugely popular Sunday afternoon entertainment. "The Valley" is also known for its night life. 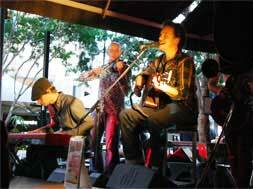 Chinatown, with its eateries and night life, is also situated in Fortitude Valley. 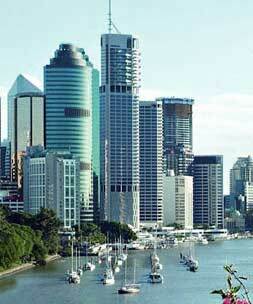 historic buildings scattered througout the CBD and other parts of Brisbane. And speaking of history, what about the Breakfast Creek Hotel, which has its own resident ghost and a fabulous old public bar where journos and politicians used to rub noses in the '60s. Brisbane has some colourful shopping areas. Paddington, in particular, is steeped in history because of all its old workers cottages now revitalised as shops. 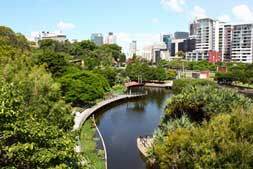 For some peace and quiet, Roma Street Parkland is a green area with gardens and rainforest walks, which is adjacent to the Roma Street Railway Station. If you have the time for day trips, there are any number of fun things to do on Queensland's fabulous Gold Coast, two hours south of Brisbane. 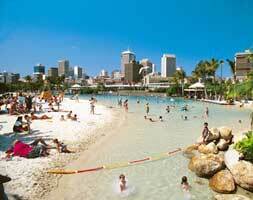 There you will find Dreamworld and Movie World, Sea World and Wet and Wild. Travelling north of the city, there is the fabulous Sunshine Coast, a mecca for beaches and home to Australia Zoo, the creation of the famous Crocodile Hunter, the late Steve Irwin. Looking for a place to stay? Everything from five, four, three and two-star hotels to backpackers, B&B and guest houses. 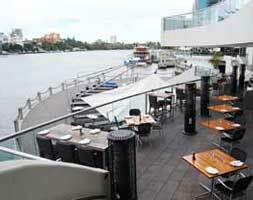 All images on Brisbane.com.au copyright Brisbane Online Pty Ltd unless flagged otherwise.